Okey dokey. 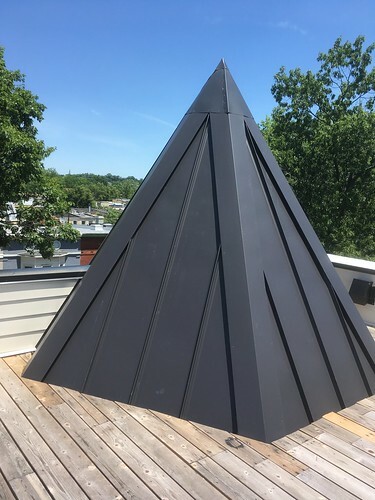 The fugly, and I’m gonna call it fugly, ’cause it was a plan of ugly of freaking magnitude, plan of replacing the top level of 319 R St NW with a meh 3rd floor and an out of proportion dunce hat is no more. The Historic Landmark application, killed that. So the developers played chicken, lost and looks like they’re gonna try to recoup their money by selling it, unimproved, for $1.05 million. Unimproved. I don’t think the plans are worth hundreds of thousands of dollars. But that’s just my opinion. So what’s the plan? Go down. There will be three floors but you’ll have to go down, into the basement. Have they dug the basement? I don’t think so, so there is no guarantee of anything. If they haven’t, you could hit water. Anywho. The top floor is a rooftop deck of sorts, because you can’t change the top anymore. Because of historic stuff. 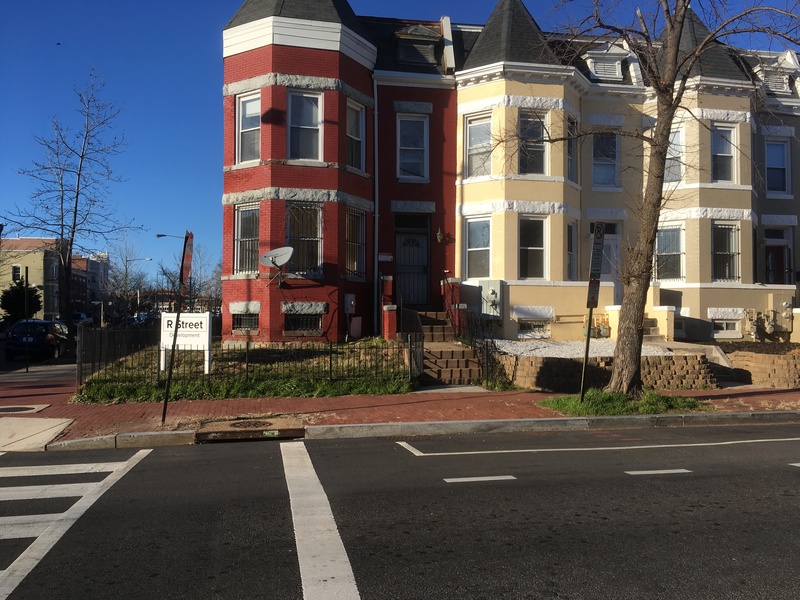 If they just left the damned turret alone, like 210 P Street NW, they would have had more freedom to put on a 3rd floor. Turret on 210 P St NW. But, noooooo. They had to plan to destroy the original turret or threaten to tear down the building. Now they expect someone to pay over a million dollars for the mess they made. DC has too many historic districts (HD) and just recently got one more as Bloomingdale fell to this sad fate of HD collecting. So about 1 in 5 DC properties is some historic something or another. 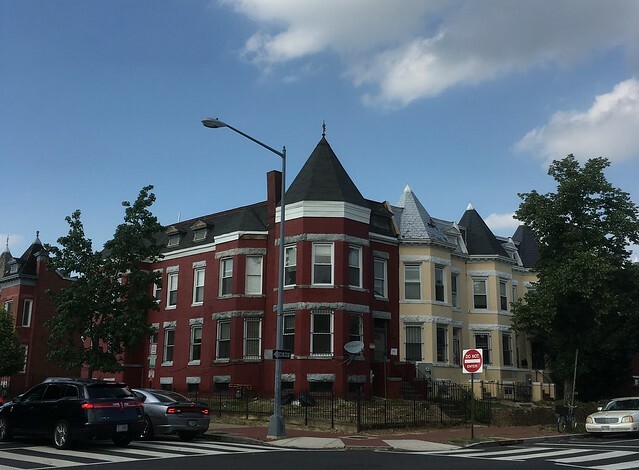 DC is on its way to becoming like our sister city Baltimore where some historic districts are respected and others, kinda ignored, making the designation meaningless. Maybe it needs to be made meaningless. 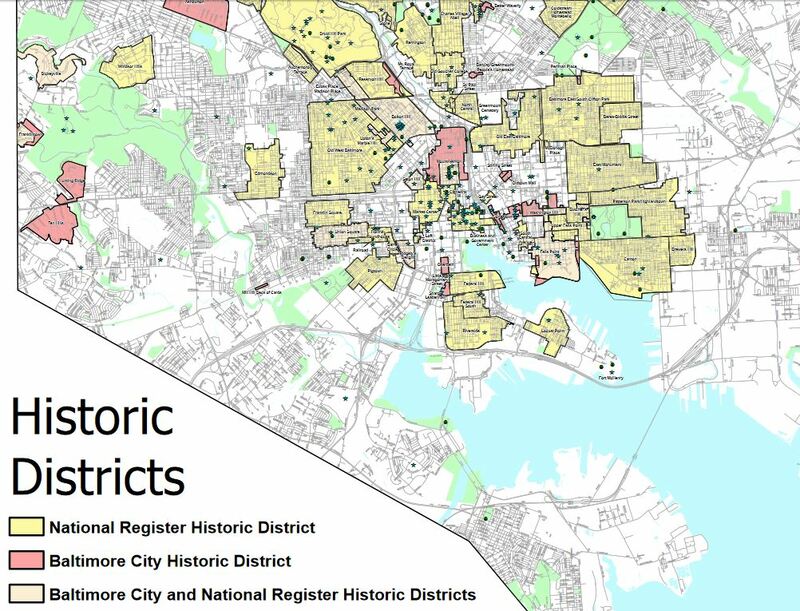 So I own a small rental in Baltimore which happens to be in a historic district and the neighborhood is listed with the National Register of Historic Places. Historic districts in Baltimore are a different animal than the HDs in DC from what I observed. When I had a local charm city architect over, I mentioned the vinyl window I had in my house and the other vinyl windows I saw in the neighborhood. He said, “Yeah, they’re not supposed to do that but….” and he shrugged and we moved on to other topics. 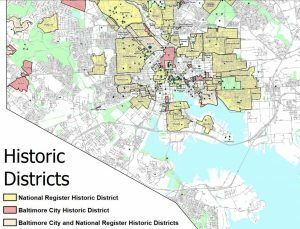 Baltimore has over 60 historic districts, DC has over 30. The Baltimore Sun supposed that 1 in 3 buildings was listed on the National Register. I have no idea how many of those include abandoned shells. Baltimore also has a local tax incentive to get homeowners on board, but the logic in how it applies confuse me. There are newish condos just outside the district’s boundaries that advertised the 10 year tax credit. Of course there is a lot in Baltimore where the logic of how they apply a lot of things confuse me. I wonder if the trend to add more and more historic districts will create an environment where the original intents will be undermined because it brings in too many unwilling participants, thin supporters and stretch the resources of the enforcers. Maybe. We’ll see. Recently a co-worker of mine retired. At his retirement party a few other retirees I knew showed up and I remembered what the place was like when they still worked there, and how the place will change when my co-worker becomes another retiree. The building where we work has, for the most part, despite several renovations since it was built in the early 20th Century, remained unchanged. But the workplace keeps changing, with each new person, with each retirement, departure, and in some cases, death. The neighborhood is the same way. The spirit of my block changed with the crowd who showed up in the 00s and eventually departed in the early teens. The buildings has relatively remained unchanged. There has been some infill here, a pop up or pop back there, but for the most part the buildings have not changed much over the years. But the block has changed, and will continue to do so long after I’ve moved on*. 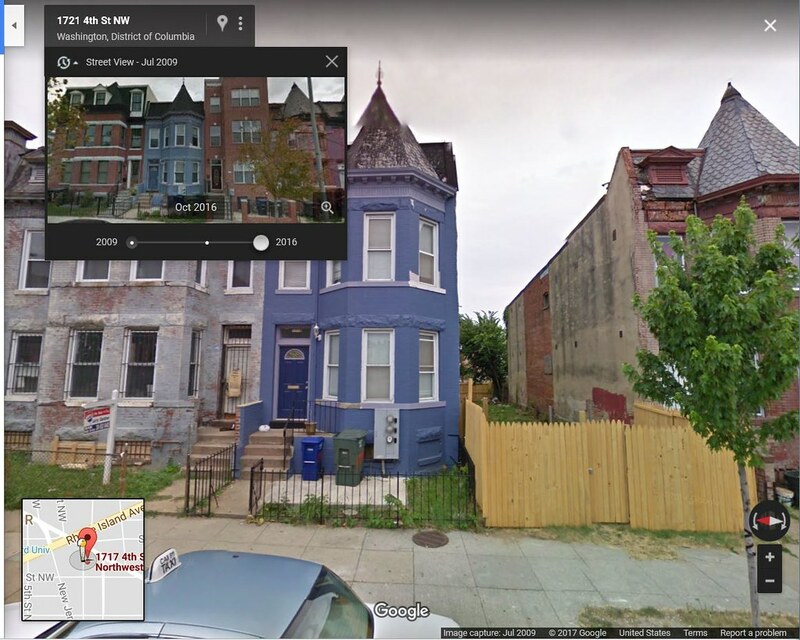 If there was to be another possible historic landmarking or whatever in Truxton Circle I would predict it would happen with the Bates Street houses. I’d hope not, but there is a history there, and with a few exceptions the overall style on the unit to the 200 blocks of Bates have been unchanged. However the character of Bates Street has changed, and continues to change. 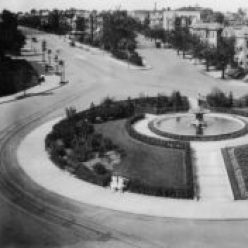 It’s not the same street when the developer, the Washington Sanitary Improvement Company built them in the 1900s. It was purposefully segregated and all rentals. 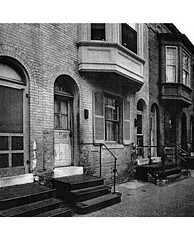 By the 1940s it there were a few Black households on Bates, and one of the few places with Whites in Truxton Circle. By the 1960s the blocks were o n the government’s radar for urban renewal because it was run down. Most of the families (according to a report about Bates of the time) could only afford public housing, if they were to be relocated. However the urban renewal and the large scale demolition of neighborhoods was challenged. 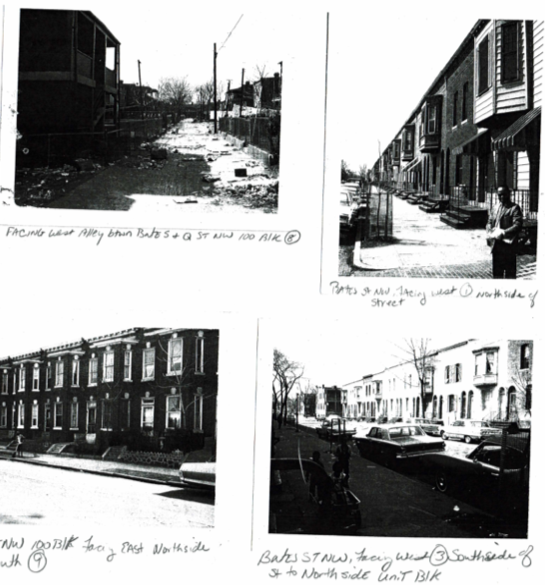 Instead the some of the Bates St buildings were rehabilitated, but the neighborhood was still struggling. When I showed up in the early 21st Century there were many Section 8 houses, or houses that neighbors strongly suspected were Section 8, because the families’ crises kept playing out on the streets. A lot of those people are gone, but the buildings, for the most part, remain the same, all without the Historic Preservation Review Board. Being a person who participates in communal worship, I have heard on more than one occasion, a church is the congregation/ people, not the building. Likewise, the character of the neighborhood is the people, not the buildings. 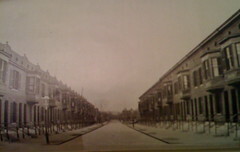 Bates Street has been a White enclave, a poor Black street and now a mixed income, mixed race neighborhood. In twenty years, it might be something else, and no building preservation will prevent it. *There is no way I’m retiring here. The stairs in my house are murder on my knees. From what I can see for 4th St NW it includes 1709-1721 4th St NW. Thing is 1717 4th Street was infill, built sometime after 2009.